IN ADDITION TO A CAPTIVATING STORYLINE, THERE ARE PLENTY OF SUB-EVENTS THAT REVEAL MORE ABOUT THE CHARACTERS FOUND IN TALES OF BERSERIA. WE WILL BE UPDATING THIS PAGE AS WE GO ALONG. 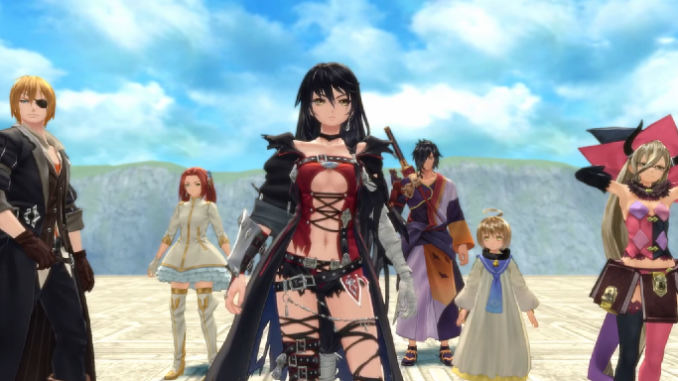 Aside from the main storyline, Tales of Berseria has a multitude of sub-events that you can choose to do along the way. Below are just some of the more interesting ones that dig deeper into the story of the characters found in the game. Go to Izult Harbur and look for Murujimu. Then, go to the Leylines by taking the path through the ruins past Abal. Once there, a conversation will ensue. Proceed along the path until you come to a hole in the ground, then walk to the side of it to find the ! event marker. Afterwards, head back by taking the orange warp point found there in the Leylines. Proceed to Cadonics Harbor, then make for Vesta Tunnel. Once there, go to Kurogane’s sword collection and look for the ! event marker. Walk around and check the stones near the chest. Afterwards, head to Reneed and look for Live. He will be hanging around near the inn with a ! above him. Then, go to Figal and get the Unicorn Horn and head back to Reneed and talk to Live again. Then, head to Aldina Grasslands entrance and take the path to Gallis Lake Road and look for the next ingredient of the medicine. Head back to Reneed and talk to Live’s mother, then proceed to Davar Woods for the last ingredient (Malak’s Tear) from an Exorcist there. Head back to Reneed one last time to finish the sub-event. Rokurou’s sub-event requires defeating various gigantos across different areas as you progress through the main storyline. First, defeat the Orc Kong at Danna Highway. It is weak to wind and resists fire and water. Go to Reneed and talk to the crowd with a ! located at the sphere’s east. Proceed to East Raban and defeat the Cellke. It is weak to normal and earth magic, and resists water. Then, proceed to Vordigan and go the the roof (you’ll need to get inside the dungeon and make for the door right next to a save point). Once on the roof, defeat the Lancelot. He’s weak to water and resists normal, fire and earth magic. Much further into the game, head to Saviour’s Throne and defeat the Ryuumajin there. It is weak to wind and resists water, normal and earth attacks. Afterwards, go to Rogress and talk to Tabatha to finish the sub-event. After traveling to Paramidis, you will return to Zexon Harbour. There, talk to a man with a ! at the west part of the harbour. Velvet and Magilou will be part of a show that ends in disaster. Then, at Helavisa, head for the tavern and talk to a man with !. Laphicet and Magilou will stage an act that again ends in failure. Then, at Tarieshin, look for a man by the ledge with a !. Eleanor and Magilou will attempt another show. At Stoneberry, talk to the man with a ! near a big tree stump where Eizen and Magilou will put on another show. Then, at Izult, talk to the person with ! at the tavern to stage a show with Rokurou and Magilou. At Rogress, talk to person with !. Finally, head to Zamal Stone Cave for the conclusion of the sub-event. You will need to defeat the Fatty Giganto there. It is weak to earth and resists normal and fire magic. In Melshio, head for the ! at the church. This will trigger Eleanor’s sub-event. Then at Haria, you will encounter a troll enemy. It is weak to normal and water, and resists fire, earth and wind. After defeating the troll, interact with the ! on the ground, then take a bottle and go back to Melshio and talk to Dyle. Then, follow Medisa and Moana to Killaraus Volcano. You will see a ! on your way there. Back at Melshio, proceed to the inn and talk to Moana. Then, look for Dyle at the northern section of the area. Then, head back to the inn and get the key behind the dog there. Head out and hop on the icy rocks to a chest. Then, go back to the inn and approach the dogs there. Then, proceed to the ! to finish Eleanor’s sub-event. Once you revisit Izult, talk to Penguin at the inn, there rest there. Leave the inn and approach Penguin. A battle with Jude will begin. He is weak to fire and resists wind. After beating Jude, talk to the old woman in the church at Tarieshin. Then, head for Figal Snow Fields and make for the southern end. Milla will be there and challenge you. To fight Jude and Milla together, talk to the Katz on the bridge at Reneed. Then, go up the stairs at the back of Normin Island. The pari will engage you there. After defeating the Managarmr, proceed to Melshio and make for the exit to the east. Then, head south to the ! to fight Zaveid. Keep in mind that he has resistance to earth attacks. Afterwards, go to Reneed and look for the guild member with a !. You will need to kill the Shen Long that has wreaked havoc in Aldina Grassland. Then, make your way to the cliff to engage the Shenlong. It is weak to fire, and resists water, earth and wind. Return to Tarieshin to complete the sub-event. You need to have opened at least 38 Katz Boxes to obtain the Nekonon’s Invitation. Go to Tarieshin Harbor and go up the ladder there, Use the Rareboard to get to the other side and talk to the Katz. After completing the main storyline, you’ll need to find 4 Normins scattered around the world. Red Normin – Fordis Hostoric Ruins, northwest of the first floor next to the treasure box. Blue Normin – Haria Village, in the middle of the village. Black Normin – Cadonics Harbor, in a box next to the weapon shop. Green Normin – Stoneberry, somewhere in the field. Phoenix Normin can then be encountered in Titania. He is extremely powerful at level 100. He is weak to earth and resists fire and water. Make sure that you have rescued at least 38 Katz to be able to access Katz Village where Dark Turtlez will be. After defeating Phoenix Normin, you will receive Edna’s Letter from a Turtlez there. Then, head for Gaiburg Iceland and talk to the Turtlez Merchant. Then, head for Tarieshin and talk to Katz that will take you to Katz Village. Once there, proceed to the central square to engage the Dark Turtlez. jesus dude if you’re gonna write it in english, write all terms and names in the English names they’ve been given.